The Go Rhino SR40 Series Roof Rack is a perfect solution when your vehicle needs more storage space. This carrier comes in two sizes, 48" or 60" long and have tabs for mounting 4 - 3" driving lights. 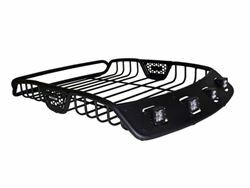 These carries install over existing factory or aftermarket cross bars and do not require any drilling into your vehicle or rack. In order do make sure your cargo is secure the sides of the carrier are 6" high and have tie down points built in to make sure that everything can be easily secured. Ideal for use with luggage bags or straps. This rack is made from tubular, mild steel and has a tough black textured powder coat finish. Rhino Rack backs this rack with a 5 year warranty. Rack Length: 48 " or 60"